Welcome to our Melbourne - heart of Australia’s classic south. Melbourne has compelling appeal in its gardens, its history, its character and its charm. 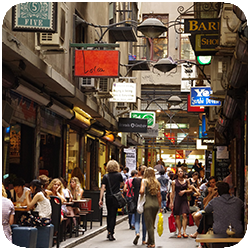 Arcades, laneways, Chinatown, gardens and lifestyle form the richness of this most dynamic and vibrant city.